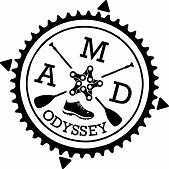 AMD Odyssey currently offers two events, namely the Goukamma Fat Bike Challenge and the Witsand Whale MTB Race. Hosted during the Sedgefield Slow Festival, the Garden Route Fat Bike Challenge is a moderate race designed to showcase a section of the Southern Cape coastline. Targeting primarily Fat Bikes, the route starts at the Sedgefield village green and sets out eastwards to a gravel road overlooking Lake Pleasant before entering the Goukamma Nature Reserve. Inside the reserve the route follows sandy jeep tracks across vegetated sand dunes before a exhilarating descent to the shoreline. After a transition to the beach the route turns westwards towards the Sedgefield Lagoon mouth along pristine beaches at the base of fossilized sand dune cliffs before exiting at the Pilli Pilli Beach Restaurant. The race is a 28Km loop with the start and finish sections through suburbia before entering of the the Goukamma Nature Reserve. Inside the reserve, the first half inside the reserve is 11Km along sandy jeep tracks which are regularly mined by Cape Dune Mole Rats which makes it challenging for mountain bikes, but ideal for fat bikes. On the 9Km beach stage, the shoreline is a strip of sandy beaches flanked by fossilized dune cliffs and rock pools interspersed with fossil dune outcrops. Water : There will be no water tables and there is no fresh surface water along the route, carry water. Bikes : Fat Bike, Plus Bikes and Mountain bikes can enter, but tire pressure has to be low to minimise damage to the dunes. Puncture Kit : Tubeless is preferable. While there are no 'duiveljies' en route, there are some emergent thorny plants along the jeep tracks, so make sure you have a puncture kit.